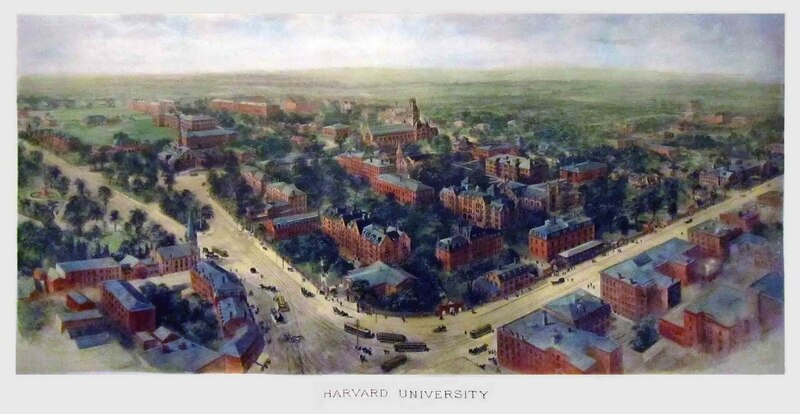 At the turn of the century, the accomplished landscape artist Richard Rummell (1848-1924) painted a panoramic bird’s-eye view watercolor of Harvard University. From this watercolor, a copper-plate was engraved and a limited number of pulls (engravings) were distributed. Unlike any other view of Harvard from the period, the Rummell plate is a glorious panoramic view of the entire campus. Capturing the spirit of the University at the turn of the century, the earliest and most iconic buildings found at Harvard are featured. The turn of the 20th century was an monumentally transformational period for the University. Led by President Charles W. Eliot, Harvard's international reputation flourished, while the size and quality of the student body surged. The result was a plethora of new construction to complement the emergence of new programs, graduate schools, labs, clinics, and the largest academic library in the world. Facing Northeast, the view elegantly profiles Harvard Yard and the surrounding buildings at a pivotal point in school history. On the Southwest corner of the yard, where Massachusetts Avenue meets Peabody street, a small building stands where Lehman Hall (constructed in 1925) proudly rests today. To the right, the Wadsworth House (1726), home of the headquarters of the Harvard Alumni Association is clearly distinguishable, next to Boylston Hall (1858) and dwarfed by Grays Hall (1863)--Harvard's first building to provide running water through taps in the basement. Toward the middle of the view, Weld Hall (1871), University Hall (1815), and Thayer hall (1871) all run alongside the Old Yard, paralleled by one of the oldest sections of campus architecture- Massachusetts Hall (1720), Harvard Hall (1766), Hollis Hall (1763), and Stoughton Hall (1805). Massachusetts Hall, designed by John Levrett and Benjamin Wadsworth, is Harvard's oldest surviving bulding as well as the oldest dormitory in the United States, having served as everything from a refuge for American soldiers during the Seige of Boston in 1776 to the office space of the University President and distinguished administrators today. Across Cambridge street to the north, Memorial Hall (1878) reaches proudly skyward, commemorating Harvard graduates who fought for the Union in the Civil War and solidifying the iconic stature of the university as Rummell's delicate hand stretches toward the rolling green horizon. The Harvard Rummell view is printed on fine woven paper from the original 1915 engraved copper-plate by a master printer. Coloring is performed by a team of expert watercolorists, and framing is completed in-house with acid-free mat and high grade plexiglass that fits all museum specifications.